Pim ps and pushers, priests and preachers, saints and sinners – all closer than you might think. More on that thought in a minute. My dad collects coins. As a coin collector, you learn to look at each of the coins you get in change. Check the date, check where it was minted, check the overall condition – check to see if you want to take the coin out of circulation by adding it to your collection. I never caught the coin collecting bug, but I do check over my coins – especially if I see one that seems a bit out of place. It is amazing to think, but at least a couple times a year I will find a “Wheat Penny” in my change. Wheat pennies stopped being minted in the 50s. One day this past week I was picking through my pocket change and saw a nickel that seemed a bit worse for wear. Thomas Jefferson had very little detail left in his face, and Monticello (Jefferson’s home depicted on the back) was nearly worn smooth. The date on the coin is 1970. I thought to myself – Well you sure have been bouncing around over the years, haven’t you? That thought got me thinking bigger thoughts. How many purses and pockets has this 5-cent piece been in and out of? 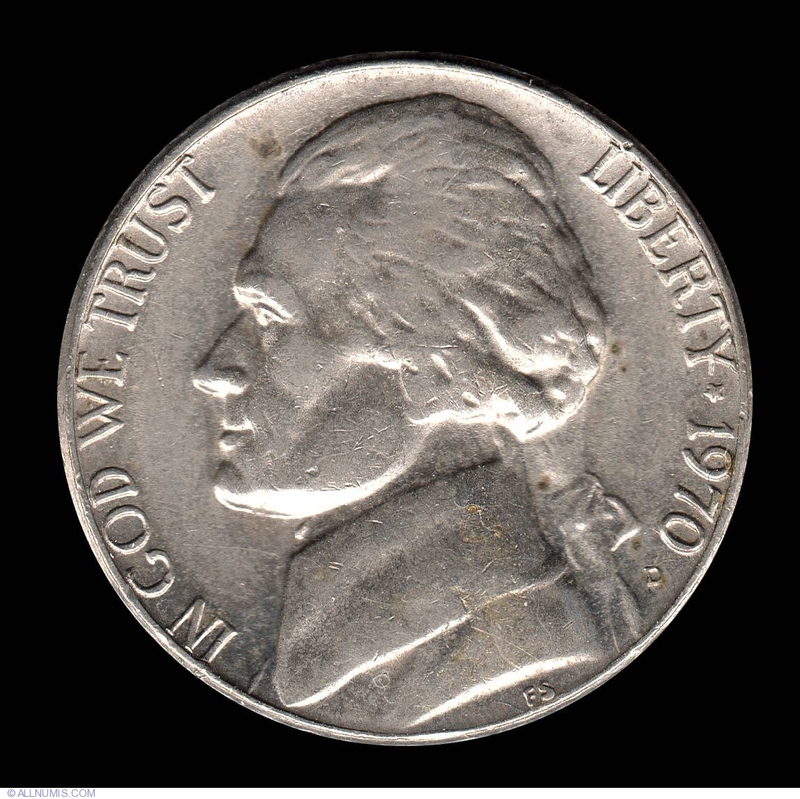 At the start of 1970, this humble nickel could buy a full-sized candy bar (by 1974 it took two nickels or a dime – pretty steep inflation for a mere four years). Little kids would collect glass bottles and return them for the deposits or dig through the couch cushions after their parents had friends over to get nickels. Then those little hands would bring the nickels to the local shop and get the candy of their choice. Older kids made money their way, and adults other ways as well. Regardless of how one made money, the result would be nickels in pockets and purses all up and down the age spectrum. More interesting to me though is all the different types of people who have touched this 46-year-old nickel. Now we are back to the pimps and pushers, priests and preachers, the saints and sinners (I will leave it to you to decide which is which among the list). I could add the black and the white, the red and the yellow, the rich and the poor, and any other classification one might think of to segregate people. At some point or another, this nickel has been in the hands of all of the above at one point or another this past 46 years. But the person holding the nickel at the moment does not think of that. We choose not to see beyond ourselves – our chosen (or not chosen) circles. A choice not to see the pimps and the pushers and the people they hurt through prostitution and drugs. A choice not to see the ___________ (pick a color not your own) and to try to understand life through those different eyes. A choice not to see the poor and suffering who could use a nickel much more than the rest of the population. Yet, we are as interconnected as our pocket change. We all live in this world together, and in one way or another, our lives are interweaved – even when we choose not to see it. It is Christmas season (actually Advent but that is a story for a different day), and people are thinking about what they will give and to whom. Let me suggest putting your pocket change to work toward changing the lives of those in need. You will see bell ringers at the shops asking for change, and that is a good choice. There are many other good choices as well. Let me make one more suggestion. My colleague Fr Dana Craft is a missionary to Guatemala. He ministers to some of the most downtrodden people there are – those who truly make their homes in the city garbage dump. As you consider where you can make a difference in a person’s life this year please consider the men, women, and children Dana ministers to. In order to donate go www.amissionchallenge.org. Your pocket change can change a life – How will the nickel in your pocket be spent? This entry was posted in Christian Living, Holidays and tagged Advent, Christmas, Poverty. Bookmark the permalink.